Thirteen years have passed since the last time the Eagles found their way to the Super Bowl. The wounds from that 24-21 loss to the Patriots in Jacksonville have apparently been reopened by Philadelphia's return to the big dance. What survives from that magical 2004-05 season is the bitter grudge between Donovan McNabb and Terrell Owens, two of the most talented Eagles to ever suit up on the same team. Their inability to manage the relationship between star quarterback and star wide receiver ultimately unraveled a core that could have remained in contention for several more years. Morganti: Hey, Dallas ... NOW who's America's team? In 2012, McNabb said he felt it was "sad" that Owens was still hung up on their rift after so many years. His attempts to work things out with Owens at the time and later on, McNabb claimed, were like talking to a wall. Owens, for his part, has never let slip an opportunity to disparage McNabb's leadership and quality as a teammate. In a lengthy interview with Skip Bayless last year on "Undisputed," Owens said the feud began with McNabb "disrespecting" him in the huddle during a game in the 2004-05 season. McNabb failed to throw the ball to a wide-open Owens on a play that was specifically drawn up for Owens. When Owens mentioned he was open, McNabb allegedly told him to "shut the F up" in front of his teammates — and it all went downhill from there. The post-football life of Owens, of course, has been primarily in reality television. This year, Owens is on MTV's "The Challenge: Champs vs. Stars," where he recently found himself in another "disrespectful" blowout with Chris “C.T.” Tamburello, who mocked him for blowing through $70 million. In a radio appearance Wednesday on SiriusXM’s “The Morning Men” with Evan Cohen and Mike Babchik, Owens was asked whether he'd rather go out to dinner with McNabb or Tamburello. “Probably C.T. We can talk it over dinner,” Owens said. "[McNabb's] a funny guy. He’s not funny ‘ha ha.’ Me, personally, I don’t do well with two-faced people." The interview came days after Owens again tweeted about McNabb. 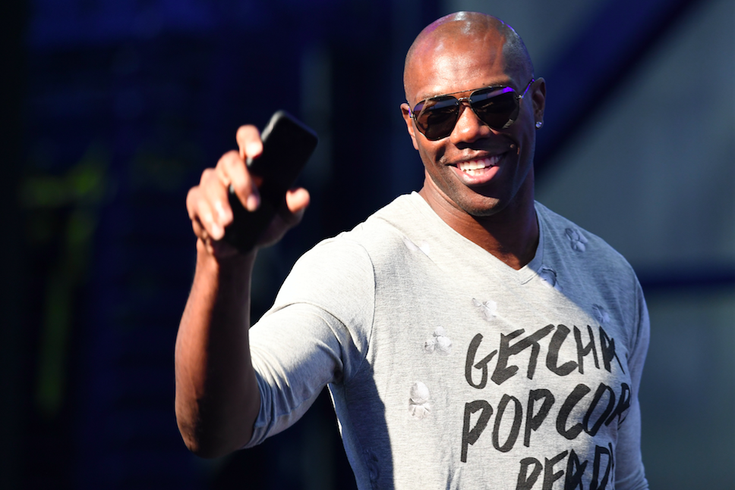 McNabb is one of several current and former NFL Network employees targeted in a sexual harassment lawsuit filed by former stylist Jamie Cantor, who claims McNabb sent her explicit text messages. The allegations cost McNabb his job at ESPN. Nothing would cleanse the bad taste of this sordid patch in Eagles history like a Super Bowl win over the New England Patriots. And wouldn't you know it, Owens has some thoughts on the Super Bowl.